This TedX talk by Zach King expresses very well what I love about the Internet and technology. Aside form the Jedi Kittens it is the tools that are transforming every industry and give us the opportunity to inspire the world with our ideas. So, what are we waiting for to inspire the world? 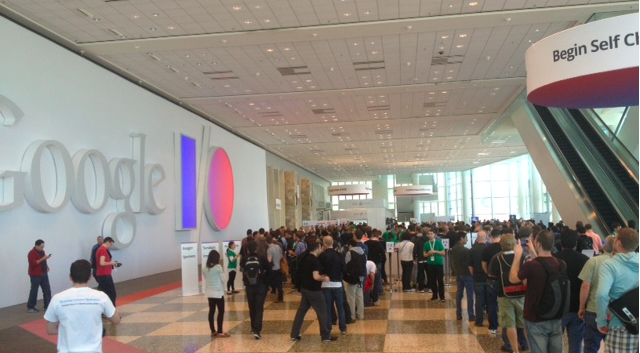 It’s day 2 at Google I/O so by now you would have seen most of the major announcements made by the lead Googlers during I/O13 keynote opening session. The presentation went on for a solid 3 hours, you can view it here . For me, the product highlights were: of course the all access music service, the new and awesomely enhanced maps (with content discovery, 3D imagery inside buildings, offers, geo fencing, activity recognition and live traffic event), as well as the Star Trek computer project, which is the future of search (awesome and related to one of my previous post) and the new user features for Google+ (photo sharing & editing, content recommendation # and multiplatform sign on- a real plus on Facebook). A multitude of journalists and bloggers have covered the event and you can learn the details of all these features elsewhere (Google: I/O13). The two things I will focus on this live post are: My personal experience being part of the crowd at Google I/O and how Google is building the future of the Internet. French style… I might have slightly jumped the queue at the entrance and then waited for another 1h30min, I finally made it to the main theatre. It filled up quick, every single sit taken, lots of people standing in the aisles. Dimmed light, smooth electronic tunes playing in the background. Countdown clocks on the big screens and a tangible build of excitement as the clocks got closer to 0! The last 10 seconds were literally like NYE. Google brought us NYE at 9am, at that point in time we didn’t know that Google was also going to bring us Christmas at 2pm by giving away free Chorme books to everyone! The first speaker to get on stage was Vic Gundotra (Vice President). All his followers were just as polished and impressive. Naturally at ease in front of 6,000 demoing live technologies. Very inspiring presentations, mixed with animations and live demos… and Larry Page came on stage to clos off the keynote! He gave a casual chat about where Google is now opportunities ahead. He even opened to the floor for questions…. and they were as diverse as: how does Google protects freedom of speech to how to help youngsters be positive about technology or how to get more women in tech carrers… which brings me to my second point: How Google is building the future of the Internet. The future of the Internet will be seamlessly multiplatform, easy to use, frictionless, intuitive and infiltrated in everything we do. After spending 2 days at I/O it is hard to say if the future is organically shaping up that way or if Google is building it that way. Larry Page says that technology must get out of the way for us to spend more time doing what makes us happy. Did Google’s CEO, really said that. Yes he did! Very early on, when developing Google, like Steve Jobs, Larry recognised that the power of the Internet is not in super computers but in all the PCs in homes around the world. At the moment all these computers are connected via tiny pipes, which dramatically limits the possibilities. Google wants unleash this opportunity! Since its inception Google has aimed for big audacious goals. As Susan Wojcicki (Senior Vice President) testified, when Larry and Sergei were renting her garage their objective was to organise the world’s information… the same bold philosophy drove projects like maps, street view, Glass, Fibre etc.… and still applies now more than more than ever. That is exactly what makes me think that there is nothing that Google cannot do. It currently dominates the global online advertising market (search and display combined), keeps diversifying its revenue streams; its share just crossed $900…. Even if Larry says that there is no safe place to experiment and to roll out technology, when Google decides to index every street corner or under water spots all around the world and add real 3D images to every single spot, it puts a world class engineers in a room and ask them a way to figure it out, test it and deploy! There seems to be only one area, at the moment that Google can’t penetrate and that is healthcare. Larry’s explanation on it is just because too much regulation and that laws are now irrelevant as they were made before the Internet even existed, but he clearly sees user benefits for Google to get into space and has no shame talking about DNA sequencing…. The more time I spend in this environment, or may it’s because I just finished reading “The End of Big” but Google seems to me more and more like an institution that is some respects more influential on societies that governments. Scary or exciting? I just finished reading Steve Jobs biography by Walter Isaacson. Whether you are an Apple fanatic or not, I highly recommend the book to anyone wanting to understand the digital ear in which we live!